Heineken has just announced that it plans to invest more than than 100 million dollars in Haiti... Of course to produce more beer... What you didn't know? Heineken owns Brasserie Nationale d'Haiti (BRANA)... Poko sezi pitit... LOL... There's more! 1) a new production line will be installed the Brasserie Nationale to produce more Prestige and more Malta H.
2) Heineken will start working with Haitian farmers to buy the raw material locally... That basically means more money for the Haitian farmers. LOL... I like that... Y'ap pale, n'ap travay! 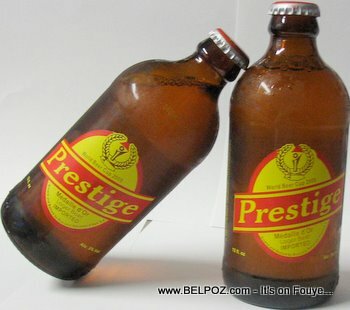 MY MESSAGE to HEINEKEN: I'd like to see PRESTIGE and its colors stamped all over Haiti. Hope you invest in PRESTIGE'ising the local bars around the country because, honestly, besides the prestige logo on the beer bottles, you are ABSENT... if you know what I mean! What do you think about Heineken's willingness to invest in Haiti? « Manifestation Haiti SAN MIZIK - Bon lide? Move lide? Sa-w Panse? Sa ap yon bon kou pou Haiti wi, epi moun pral jwen plis travay.